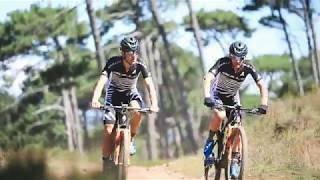 The Team BULLS will race the ABSA Cape Epic on their brand new prototypes of the Race-Fully Wild Edge Team. Check out exclusively what will be changed for the 2020 model and find out about the first riding impressions of our BULLS professionals. The BULLS professionals confirm after the first rides, that the WILD EDGE keeps what the product developer promises. Team Captain Karl Platt, who was also involved in the development by exchanging ideas with the BULLS engineers, describes his first driving impressions: "What a machine! Better than I ever imagined. The bike fits perfectly with my driving style. We have taken the experience from the development of the new BLACK ADDER framework and adapted it to the Fully. With the short chain stays I have more feeling for the rear wheel and through the extended reach I can drive a shorter stem and thus have a more direct steering behavior." "And it also has a great look! ", adds the three-time World Champion and team partner Alban Lakata the hymn of praise of Karl Platt. "It's nice to hear when everything that we have developed in recent months arrives", says the BULLS Product Development after the first positive riding impressions. "We shortened the chainstay by 10 mm compared to its predecessor, with the aim of creating a more agile rear end for a better handling in winding trails. With the seat angle of 74 degrees, we have always had very good experience, which has proven to be an optimum for the driver. However, we have extended the front - the Reach - in order to drive shorter stems. In this context, the steering angle has been designed significantly flatter now with 68 degrees. In conjunction with an optimized wheelbase, these changes bring impressive smoothness at high speeds. As a result, our WILD EDGE shows some real edges now and with its short rear end and long, flat front, it is directed "forward". And there it is supposed to go! ", Product Developer Daniel Plath sens out a message to the BULLS Boys at the Cape epic. Because a thank you for their efforts, the BULLS Product Developers take best in form of good results. The WILD EGDE TEAM is equipped with the suspension components of the sponsor FOX, as well as the SHIMANO XTR shift-brake unit. The new WILD EDGE has been consistently designed for both components. The chassis was developed for a 1x12 transmission. The kinematic scores with a very good suspension travel, as well as a sensitive response of the rear triangle. In chassis technology, we also achieved very good anti-squat values. We have had a clear concept of optimization especially for the new WILD EDGE frame: The so far proven parts will stay for sure and what could have been optimized has been improved. So the BULLS fans can look forward to our new frame in 2020. 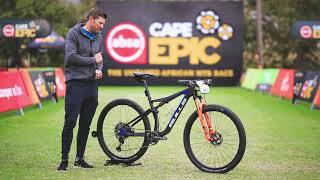 "If the BULLS professionals still have minimal change requests to the pre-production prototype after Cape Epic, then of course we will incorporate them. Otherwise, we will soon start producing the new WILD EDGE frame", says Product Development Manager Hendrik Gehring. And what does BULLS professional Simon Stiebjahn say about his new race bike? "SIMPLY AMAZING!" Thank you for the spontaneous conclusion. With a short rear triangle (chainstays) and a long, flat front (reach), the WILD EGDE shows off its entire race power. Fast in the winding trail, smooth in high-speed passages. Due to the extended reach and the flatter steering angle of 68 degreesin order to drive shorter stems. Above all, this is noticeable in an agile steering behavior, without sacrificing smoothness. With the FOX 32 Float suspension fork and Fox Float DPS shock absorber, the WILD EDGE gets two experienced partners for harmonic driving characteristics to the bike. With 100mm of travel, the bike provides just as much travel as needed for a race suspension. The new WILD EDGE was consistently designed for a 1x12 drive and we also achieved very good anti-squat values. An additional shocklink was placed between the strut, which creates a beautiful, visual line from frame to strut. In addition, this further component is a nice "set screw" to influence other suspension properties, but without having to accept design impairments. As with its predecessor, two large water bottles also fit into the frame, despite the lowered strut. Attention should also be paid to the Horstlink joint, which sits relatively close to the front. This allows an optically integrated brake mount on the rear, which also prepares for the mounting option of a flat mount brake. "F ... Chainsuck!" There is nothing more unpleasant than hearing the chain crunching over carbon and stepping into resistance. Thanks to a smartly placed Chainsuck plate, this is a thing of the past for the WILD EDGE. If you like driving with a Dropperpost seat post, the WILD EDGE gives you the opportunity to simply retrofit your bike. With an outer width of a "142" rear end and a 148 mm standard mount inside, the WILD EDGE shows its narrow but crisp "tail";). The clean, outward appearance is also due to the internal routed cables. Not a unique selling point, but a detail that deserves recognition. Our Team BULLS is currently racing the Wild Edge Prototype for 2020. Sign up and receive exclusive information when the bike is available for you.